Bruce Lipshutz has been at UC Santa Barbara since joining the faculty as an Assistant Professor in 1979. Much of his career has been focused on developing new reagents and technologies that have broad appeal in the synthetic community, many of which are now, or will soon be, commercially available (e.g., SEM-Cl, “Higher Order Cuprates”, “Cuprate-in-a-Bottle”, DCAD, “Copper Hydride-in-a-Bottle”, Ni/C, Cu/C, PTS, TPGS-750-M, etc.). The group’s efforts have, in part, shifted with an emphasis on “green chemistry”. Thus, there is ongoing development of a mix of methods in heterogeneous catalysis, including newly developed mixed metal-supported cross-coupling reagents, and homogeneous catalysis. The latter focuses on micellar catalysis to effect transition metal-catalyzed cross-couplings in water at room temperature, with an accent on development of new “designer surfactants.” Also being actively pursued are projects in total or partial synthesis of biaryls that possess axial chirality (e.g., the A-B biaryl section of vancomycin, and the antimalarial korupensamines and related targets), and syntheses associated with, and analogs derived from, coenzyme Q10. • heterogeneous catalysis; new reagents that rely on two forms of carbon as the solid support: charcoal and graphite. Transition metals that are of interest include Pd (“UC Pd”), Ni (Ni/C and Ni/Cg), and Cu (Cu/C). • homogeneous catalysis; new methodologies in asymmetric, ligand-accelerated processes (e.g., asymmetric hydrosilylation with ligated CuH). Catalysis is also playing a key role in our efforts in total synthesis, in particular as applied to axially chiral biaryls that constitute key sections of many natural products (e.g., vancomycin, michellamines, etc.). Nanotechnology is another main thrust of our group’s research, in particular within the domain of green chemistry. In this vein, micellar catalysis can offer a rare opportunity to “get organic solvents out of organic reactions.” To achieve this goal, novel ”designer” surfactants are being developed, each of which is “benign by design” in the Anastas sense (i.e., following the 12 Principles of Green Chemistry). The new methods that have been reported, and those currently under development, include Pd-catalyzed cross-couplings for Heck, Sonogashira, Suzuki-Miyaura, and Negishi reactions. Similar procedures have been discovered that effect aminations, silyations, and borylations, as well as asymmetric CuH-catalyzed hydrosilylations…all done in water at room temperature. B. H. Lipshutz, S. Ghorai, Organocatalysis in Water at Room Temperature with In-Flask Catalyst Recycling, Organic Lett. 2012, 14, 422. K. Voigtritter, N. Isley, R. Moser, D. H. Aue, B. H. Lipshutz, Regioselective reductions of ?,?-disubstituted enones catalyzed by nonracemically ligated copper hydride, Tetrahedron Symposium-in-Print (invited) 2012, 68, 3410. B. H. Lipshutz, B. R. Taft, A. R. Abela, S. Ghorai, A. Krasovskiy, C. Duplais, Palladium Catalysts in the Service of Green Chemistry, Platinum Met. Rev. 2012, 56, 62. G-P. Lu, K. R. Voigtritter, C. Cai, B. H. Lipshutz, Ligand Effects on the Stereochemical Outcome of Suzuki-Miyaura Couplings, J. Org. Chem. 2012, 77, 3700. G-P. Lu, K. R. Voigtritter, C. Cai, B. H. Lipshutz, Ligand Effects on the Stereochemistry of Stille Couplings, as Manifested in Reactions of Z-Alkenyl Halides, Chem. Commun. 2012, 48, 8661. R. Moser, S. Ghorai, B. H. Lipshutz, Modified Routes to the “Designer” Surfactant PQS, J. Org. Chem. 2012, 77, 3143. B. H. Lipshutz, N. Isley, R. Moser, H. Leuser, B. R. Taft, Rh-Catalyzed Asymmetric 1,4-Addition Reactions in Water at Room Temperature with In-Flask Catalyst Recycling, Adv. Synth. Cat. 2012, 354, 3175. 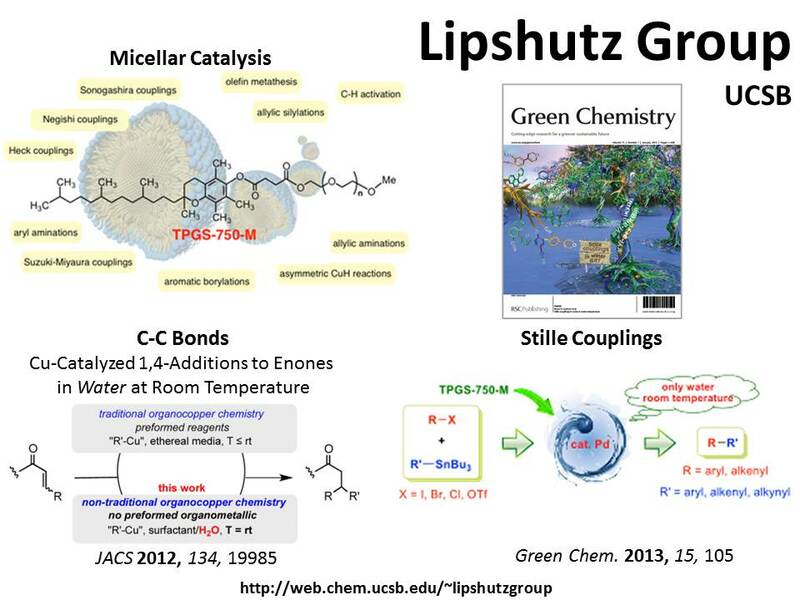 G-P. Lu, C. Cai, B. H. Lipshutz, Stille Couplings in Water at Room Temperature, Green Chemistry, 2013, 15, 105. B. H. Lipshutz, S. Huang, W. W. Y. Leong, and N. A. Isley, C-C Bond Formation via Copper-Catalyzed Conjugate Addition Reactions to Enones in Water at Room Temperature, J. Am. Chem. Soc. ASAP. Nishikata, T.; Lipshutz, B. H., Cationic Pd(II)-Catalyzed Fujiwara-Moritani Reactions at Room Temperature in Water, Organic Lett. 2010, 12, 1972. Nishikata, T.; Abela, A. R.; Lipshutz, B. H., Room Temperature C-H Activation & Cross-Coupling of Aryl Ureas in Water, Angew. Chem. Int. Ed. 2010, 49, 781. Lipshutz, B. H.; Ghorai, S., PQS-2. Ring-closing and cross-metathesis reactions on lipophilic substrates: in water only at room temperature, with in-flask catalyst recycling, Tetrahedron S-i-P, 2010, 66, 1057. Huang, S.; Voigtritter, K.; Unger, J. B.; Lipshutz, B. H., Asymmetric CuH-Catalyzed 1,4-Reductions in Water @ RT, Synlett (invited), 2010, 2041. Moser, R.; Huang, S.; Abela, A.; Lipshutz, B. H., Sustainability. Getting Organic Solvents Out of Organic Reactions, Chemistry Today, 2010, 28, 50. Abela, A.; Boskovic, Z.; Nishikata, T.; Duplais, C.; Krasovsky, A.; Lipshutz, B. H., Greening Up Cross-Coupling Chemistry, Topics in Catalysis 2010, 53, 985. Lipshutz, B. H.; Ghorai, S., PQS-2. Ring-closing and cross-metathesis reactions on lipophilic substrates: in water only at room temperature, with in-flask catalyst recycling,Tetrahedron S-i-P, 2010, 66, 1057. Moser, R.; Nishikata, T.; Lipshutz, B. H., Pd-Catalyzed Synthesis of Allylic Silanes from Allylic Ethers, Org. Lett. 2010, 12, 28.